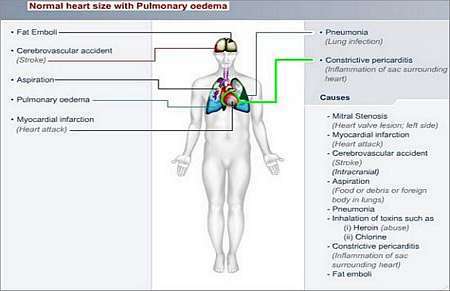 What is OEDEMA (Fluid accumulation in tissues)? Oedema occurs when excessive amounts of fluid accumulate in the tissues of the body (the interstitial tissues). Interstitial tissues represent the space in the body that is not inside the blood vessels or inside the cells of the body; the so-called third space or interstitium. A large number of conditions may lead to the accumulation of fluid in the tissues and cavities of the body. The area of accumulation of excessive fluid depends on the general posture of the patient during the day. If a person stands a lot, the swelling will occur, or fluid will accumulate, around the ankles. If a person was lying in bed, the fluid will accumulate around the sacrum or lower back area. Fluid collects in the tissues. Location or distribution of swelling of the tissues depends on whether the patient was mainly lying, sitting or standing during the day. When pressure is exerted on the areas of swollen tissue, it will cause what is called "pitting" (indentations of the tissue where pressure was exerted). In most instances, the patient will be suffering from some underlying disease or condition that causes the tissue swelling. It has to be considered that the symptoms of the underlying disease (it may be disease of the heart, kidneys and liver) will also present. Once the fluid reaches a certain level in the tissues, the cavities of the body will also accumulate fluid (areas such as the abdominal cavity or the pleural cavity inside the chest). When these cavities are in the area of a disease process, the fluid may accumulate in it from the start. Examination of total protein concentration in the blood. Chest X-rays may show pleural or pericardial effusions (fluid accumulation in pleural space). Examination of fluid aspirated from a fluid-filled cavity such as the abdominal or chest cavities (this will provide many clues or answers to the origin of the fluid). The fluid may be cultured for sensitivity (determine it there is an infective agent responsible). The underlying condition causing the abnormal fluid distribution needs to be diagnosed and treated. Fluid may be tapped from cavities such as the pleural space in the chest or the abdominal cavity; this provides symptomatic relief as well as an opportunity to analyse the fluid for diagnostic purposes. Surgical intervention may be necessary in order to remove obstructions in circulation. A high-protein diet is often required, especially in conditions of malnutrition.